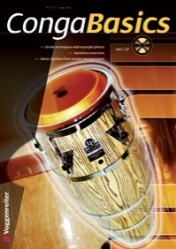 The conga is the rhythmic center of Latin percussion. In this book you will learn the basic stroke techniques for this fascinating instrument with origins deep within Latin America. The included photos are a solid help for you to quickly turn your first tries into exciting rhythms of various musical styles – from Latin-American music to rock and pop. With the accompanying CD and many exercises and rhythms, you can get started immediately. Let’s groove!